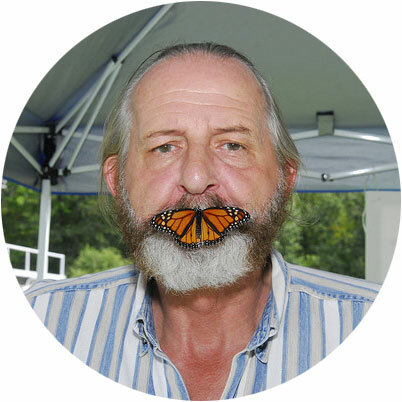 For over 35 years, Rick Mikula has been delighting audiences of all ages with his humorous and off-beat way of looking at butterflies. An award-winning author with several books to his credit, he is also a photographer and habitat consultant, and has created butterfly atriums and gardens for Dolly Parton, Hershey Foods, among others. He is currently President of Butterfly Rescue International and serves as consultant to both the Association For Butterflies and The International Butterfly Breeders Association. Rick is a co-founder and past president of the IBBA, has served as a vice president of the Canadian Butterfly Breeders and Exhibitors Association, secretary and treasurer for the New Jersey Lepidopterist Society, and on the BOD for The Center for Landscape Design and Stewardship. He is also the pioneer and inventor of the releasing butterflies at weddings and funerals and has helped to make it a global phenomenon. © Mikula Web Solutions; all rights reserved.